Okay, it’s Friday and surprise, surprise I’m late to the game again! I cannot believe that we are at the half-way point of the One Room Challenge and I’m not sure I have much to show for it! I can tell you what I did do for it this week…shop! Then if you follow me on Instagram you saw I hit the rainbow jackpot at Home Goods where I filled a cart full of happiness. I still need some more pillows, but I love these blue sweater ones for texture. 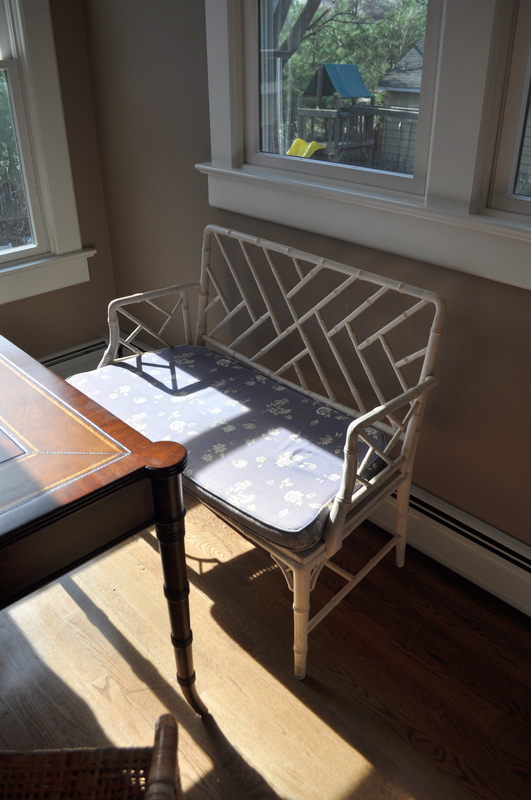 The blue trellis pattern is for the television area and I scored it on Rugs USA. 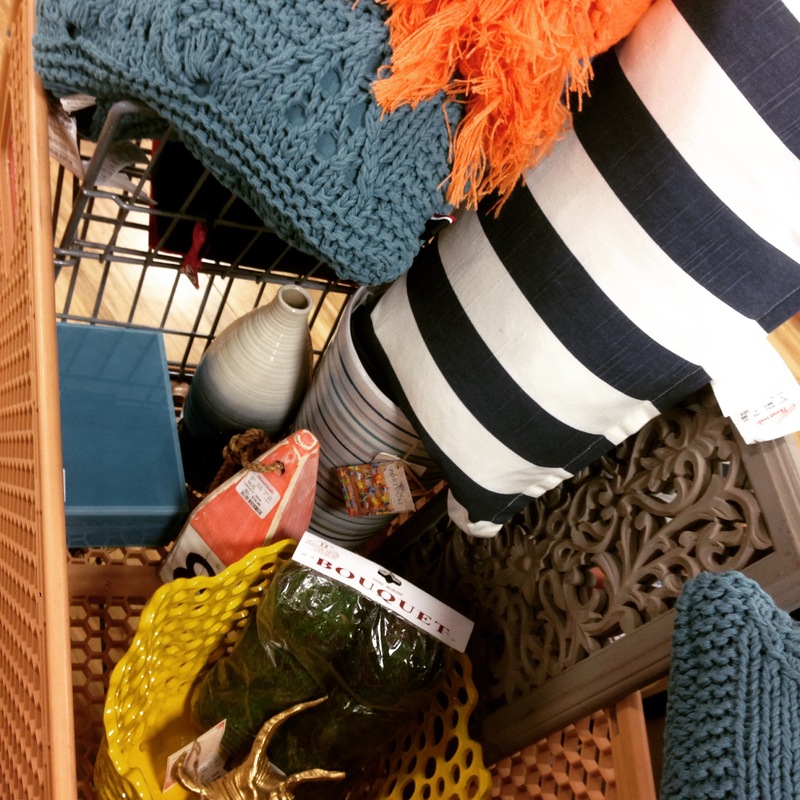 It’s wool and was 70% off…ummm okay! 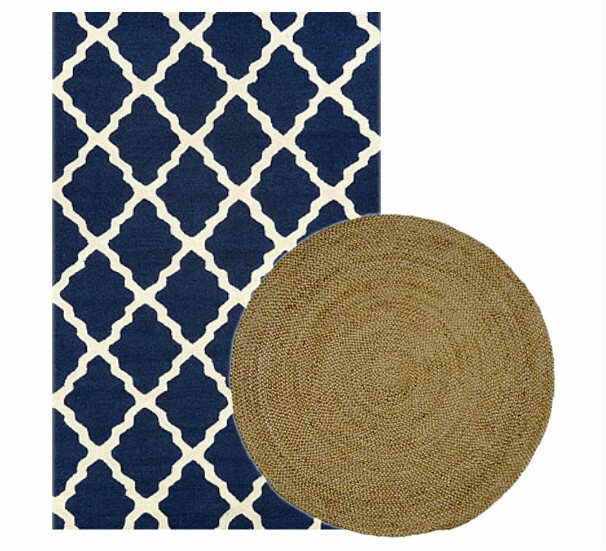 And the round braided jute rug from Bellacor is for under the game table. 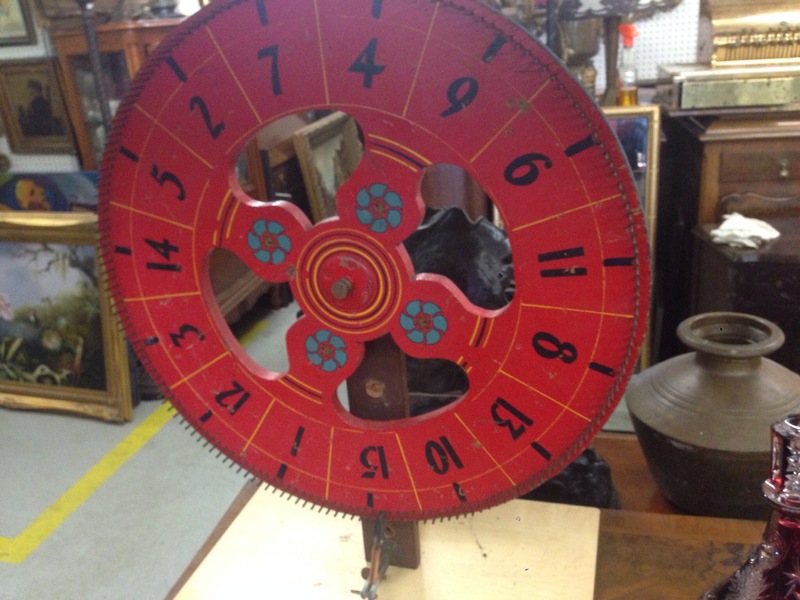 My favorite find so far is this fully functioning circa-1940’s carnival wheel that I want to install on the wall by the game table. I think it’s the perfect piece of art for that wall. 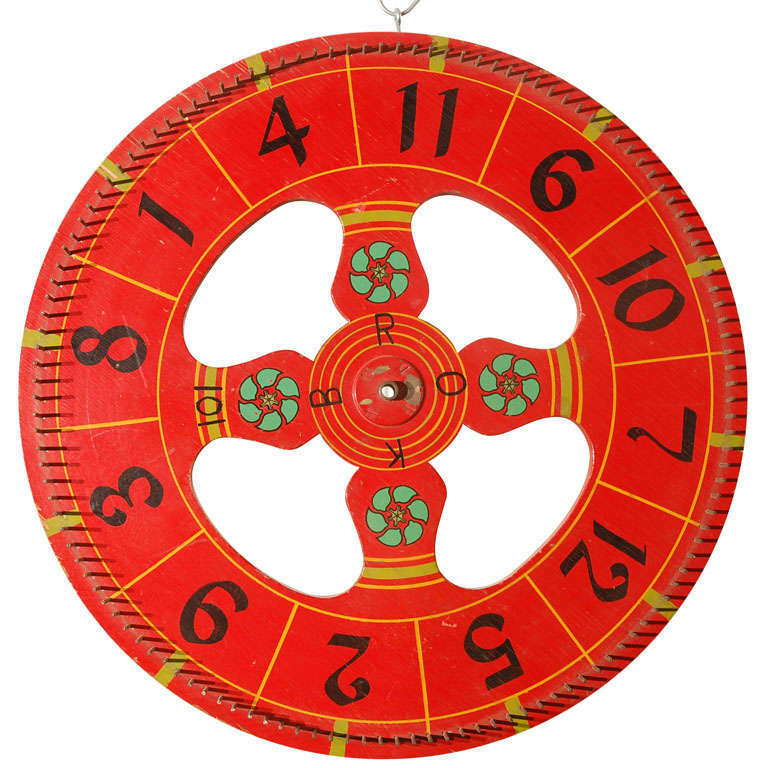 And I was even happier with my purchase when I saw that just the wheel (without the spinning mechanism), like practically the exact same one, just sold on a 1stdibs.com for $1,200!!!! So that’s where I’m at right now. 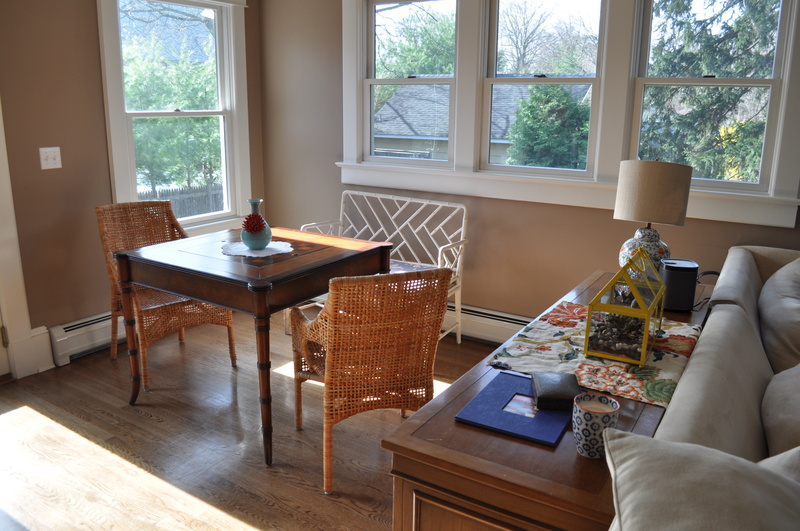 Still looking for woven blinds to fit my tricky windows and I have to figure out the best way to stuff deflated couch cushions. My two main objectives this week are to figure out the best art gallery for the television wall and to decide and act on what to do with my vintage sideboard find. Maybe you can help with the latter… Here’s what I’m talking about. I scored this baby awhile back from Craigslist and it’s perfect for the space and holds all of our games. I don’t mind the wood, but definitely want to paint or change out the hardware. But there is a lot of brown in the game area and I kinda want to get funky and paint this like a glossy navy with brass hardware. Please, any thoughts???? And don’t forget to check out all the other amazing One Room Challenge talent HERE and HERE. Peace out and Happy Friday!! 1. That carnival wheel is awesome. 2. Shopping week is the BEST and totally counts as a huge accomplishment. What fun would an empty room be? Gotta love Home Goods for some good finds! 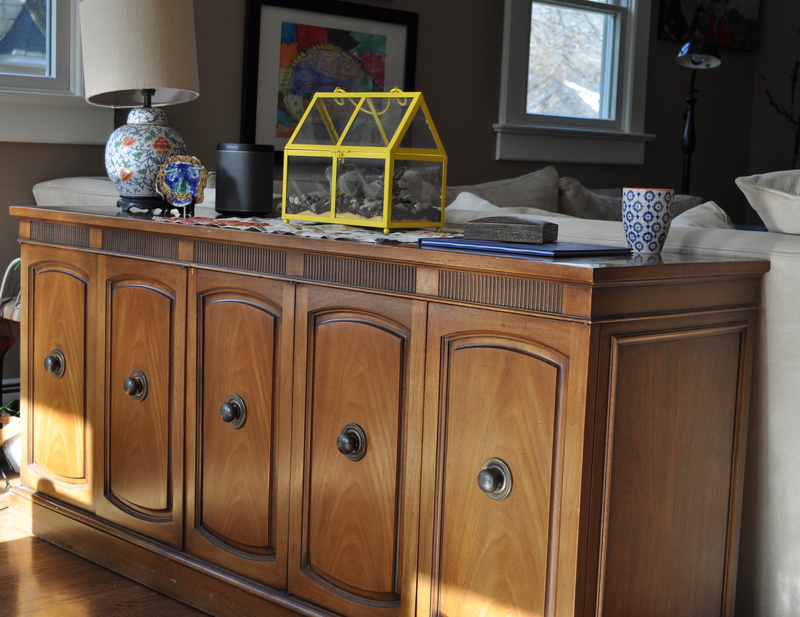 I think painting that console/cabinet navy with brass hardware would look amazing. I’m really into that navy colored paint these days. It seems to look good on everything. I’m obsessed with that bench! What an amazing score! !